Book a vacation to Boracay - the Philippines most famous holiday island! It is considered by many to be one of the best holiday islands in the world. Boracay Island is situated in the central belt of the Philippines, in the Visayas region, just off the northwest tip of Panay island, and is just seven kilometres long. 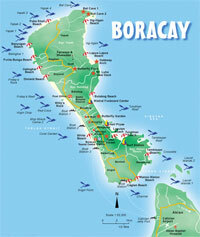 At its narrowest point, Boracay is one metre from coast to coast. Boracay has come a long way since it first became popular with backpackers, in the 1970s, who'd heard about the extensive soft white sandy beaches, and its idyllic tropical location. It wasn't long before Boracay started to be noticed. Hotels and resorts were developed, and tourists started arriving in greater numbers. As the island developed, and its facilities improved, larger hotels and resorts were built, some to high end luxury standard. In recent years Boracay has earned numerous accolades and awards from Tourism organisations and publications. In 2018, the island was closed for 6 months to allow for improvements to its infrastructure and upgrading of facilities, to make it one of the best Philippines holiday destinations. Boracay has a number of expansive sandy beaches, the most notable being White Beach, which is four kilometres in length. White Beach is on the western side of the island. On the eastern side is the shorter Bulabog beach. Other beaches of repute are Puka Beach, and Diniwid Beach, both to the north of the island. Boracay is the perfect Philippines beach destination. Boracay's famous White Beach has been described as the "finest beach in the world". Its white powdery sand stretches for two and a half miles, and is just one of many beautiful beaches Boracay has to offer. In 2015, Boracay's White Beach won the Tripadvisor Travellers' Award for "Best Beach in Asia"! Boracay is incorporated on many of our Suggested Tour Itineraries, or you can visit the island as a stand-alone Philippines Beach Break. There are direct flights from Malaysia, Singapore, and South Korea, so you can combine Boracay with destinations other than Manila! On Boracay we can accommodate you in accommodation from Standard to Luxury. Our Boracay Holidays include all transfers between the island and Manila (or Cebu), plus accommodation in either city before and/or after the visit if necessary! So if you are asking "Where are the best hotels in Boracay? or "How do I book a luxury holiday in Boracay?" simply send us your enquiry. "TripAdvisor" has also named Boracay as the "Number One Beach & Sun Destination in Asia". In the UK, "TV Quick" magazine describes Boracay's famous White Beach as the “No.1 Tropical Beach In The World". Boracay is served by two airports, both on neighbouring Panay island. The closest is Caticlan, a domestic airport not far from Caticlan Port, where the Boracay ferries depart for Cagban. The other is at Kalibo, in the north east of Panay island. Kalibo is an international airport, and handles flights from other Far East countries as well as domestic flights. Boracay links up well with Manila, Cebu, and now also El Nido, with direct flights between the locations. Book your Boracay holiday with Philippine Trails and we take care of all inter-island transfers. Boracay Island has all kinds of accommodation, suitable for all budgets. The simplest comprise rustic "nipa style huts”, which are single storey dwellings made from bamboo and palm leaves. Alongside these are the most modern luxury hotels, equipped with spas, gymnasiums, and even conference facilities. Mid-range accommodation includes boutique hotels and resorts. Most hotels and resorts are located along the length of the famous White Beach. Philippine Trails work with many of Boracay's accommodation providers, from standard to luxury. Boracay has an outstanding 18 hole Golf Course, Fairways & Bluewater, which was designed by Graham Marsh. We can arrange your stay on the island to include golf as one of the activities to enjoy. If you don't already play, and are keen to learn and take up the sport, we can arrange your tuition. Boracay is a great Philippines Golf destination in its own right. 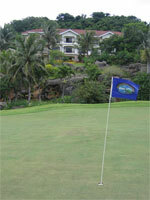 Ask us about our suggested Boracay Golf Packages. There are over 200 cafés and restaurants on Boracay offering all kinds of dishes from around the world, and to suit all budgets. Chicken and pork are the most popular meats, as in most of the Philippines, but the fresh seafood is what steals the show. Irresistably delicious and plentiful. There are also numerous bars, cafes and restaurants spread amongst the resorts, with a wide and varied choice of cuisines available. Talented local musicians will enchant you with popular filipino tunes, as well as internationally famous acoustic classics. There truly is something for everyone to enjoy in this tropical island paradise. Visitors to Boracay can take part in a number of activities, including Diving, (see our Dive Sites Map), and other water sports, plus island-hopping excursions, including a visit to nearby Motag Living Museum on Panay Island, (by request). Other Boracay activities that are popular include golf, horse riding, snorkelling, sailing, kiteboarding, windsurfing, and parasailing. On Boracay the largest market is the Talipapa, situated between White Beach and the Main Road that runs through the centre of the island. There is also a mall, called D’Mall, which has around 100 stores selling all kinds of goods and souvenirs, including beachwear, art and crafts, and antiques, many at attractively low cost. The best time to visit Boracay Island is between November and June, although it is open to visitors all year round. From November to February the weather on Boracay is comfortable and mostly dry. March to June is warmer, but generally remains dry. "Rainy season", when rain is most likely, is between July and October, although it remains warm. Over the year, temperatures on Boracay range between 24° and 32° centigrade. Contact us to arrange your Boracay vacation.